BUFFALO, N.Y. (AP) -Despite scoring twice in a five-goal Ottawa third period, Senators captain Daniel Alfredsson was happy to deflect any praise toward two players who seldom score. Anton Volchenkov snapped a third-period tie with less than 2 minutes left in regulation with his first goal of the season, and Dean McAmmond netted just his eighth goal while the Senators were short handed in the third to start a frantic rally that helped give Ottawa a dramatic 6-3 win over the Buffalo Sabres on Tuesday night. The Senators played without defenseman Wade Redden, who injured his hip against Montreal. Rookie Brian Lee replaced Redden, and made a huge stop with his skate at the goal line when Paul Gaustad tried sliding a loose puck into a gaping net with 14 minutes left in the second period. Notes: Roy left with 5 minutes left in the third because of a charley horse, but returned for two shifts afterward. ... Buffalo D Nathan Paetsch returned after missing four games because of a concussion. 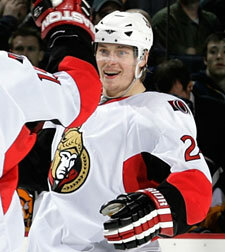 ... Lee made his NHL debut after being called-up from AHL Binghamton. ... Roy extended his points streak to six games. ... These two teams complete their eight-game season series on Thursday in Ottawa. ... Gerber is now one win shy of 100 for his NHL career. 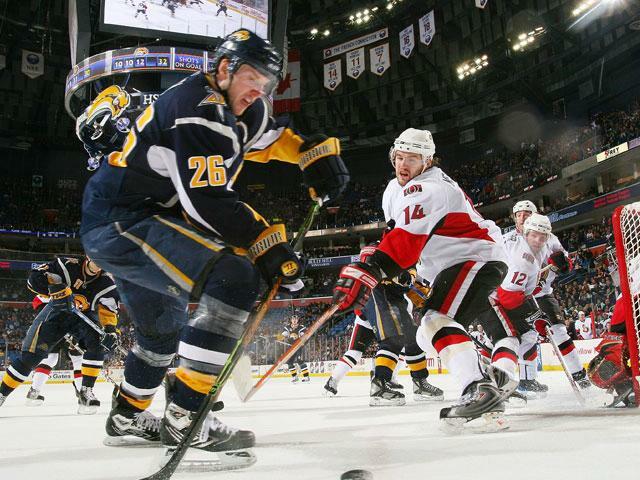 ... Ottawa C Jason Spezza extended his points streak to seven games with an assist on Alfredsson's first goal.